In nearly every sporting competition, there exists some group to set and enforce the rules. They make sure that every team is playing fair, so that each team has a chance to excel. 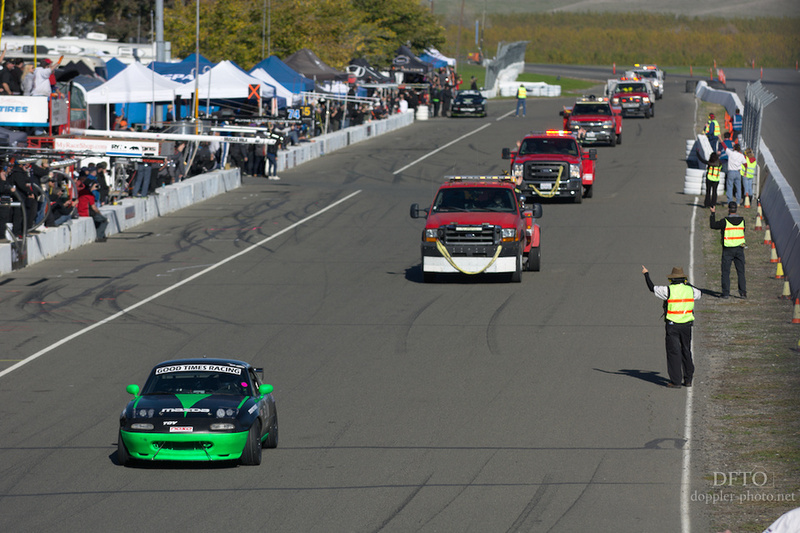 At the 25 Hours of Thunderhill, that group is Race Control. But they work via an old-timey kind of magic. Race Control is the proverbial group behind the curtain. They observe the race, and when needed exert their influence, by way of three other groups: the pit marshals, the flaggers, and the safety crew. The pit marshals wear bright vests and patrol pit lane. Like hawks. 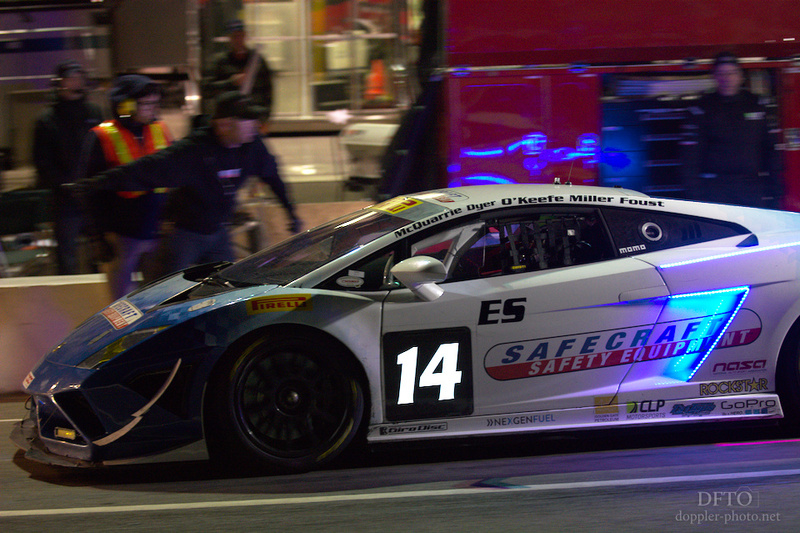 When they spot an issue or a violation, they report it to race control. 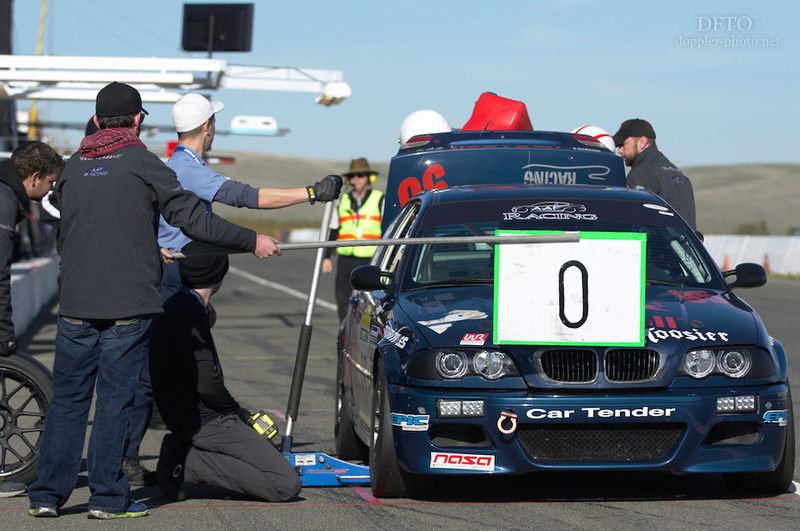 And when Race Control wants to communicate to a team, the pit marshals act as their mouthpiece, finding the team's pit box and delivering the message directly. But that communication method only works in one direction — if the teams want to talk back, they can call or visit the tower. 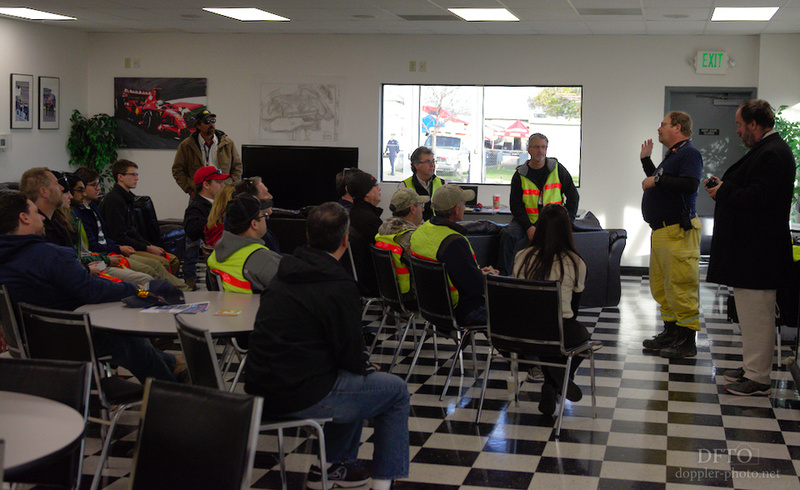 Race day starts with a briefing, where folks in the chain of command reiterated rules that the marshals should enforce, and clarified questions. I was surprised by the level of detail of some of the questions, and by the nuance required to come up with good answers. One that someone asked was, in some situation where the car is in the pit, but the team is not allowed to touch the car (without the team incurring a penalty), may the team hand the driver a bottle of water? 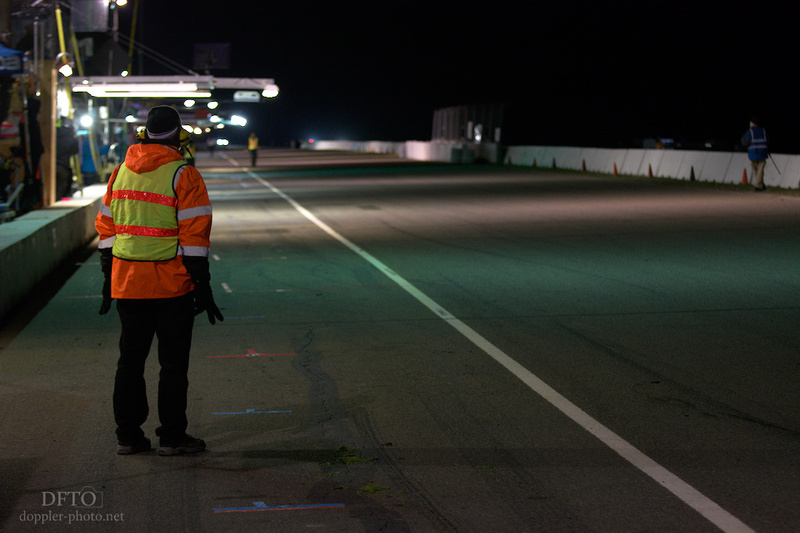 But fundamentally, the role of the pit marshal is to always be watching. Like a hawk. The role is to always be present, but to fade into the background. Excluding egregious safety issues (like someone getting under an improperly supported car), the instruction was to let teams commit violations, to note them, and then to let the crew chief (as well as race control) know after the fact. Presumably, that order places the onus on the crew themselves to avoid penalties, rather than to start watching for signals from the marshal. And then, sometimes, you just wait… Among other factors, long periods of full-course yellow tend to cause pit stops to synchronize, which then leaves the pits mostly empty for long periods of time. Whether one is thankful for or bored of those gaps depends a lot on how long you've been awake, and how long you've already spent on your feet. Then, finally, a real break. 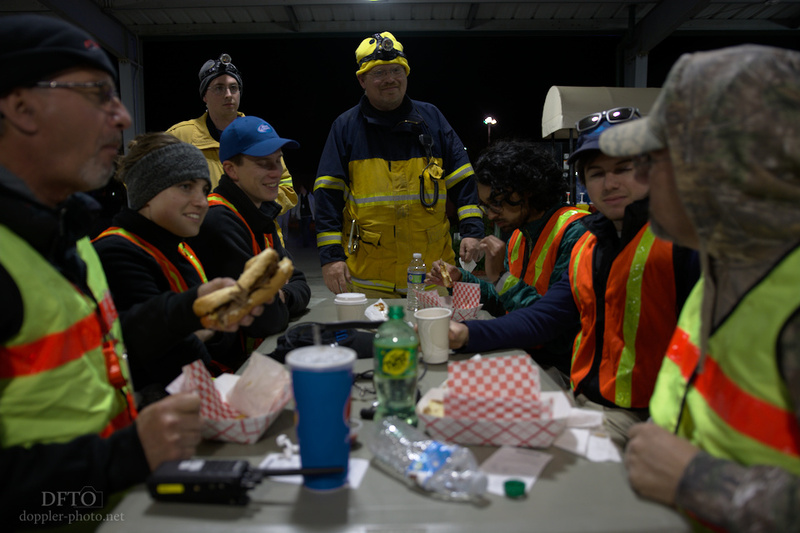 The marshals work multiple shifts, and their downtime is spent recovering from the last shift and preparing for the next. I caught up for a post-shift dinner with veteran marshals Bob (far left) and Vince (far right), as well as first-timers (left to right) Hannah, Grant, Nikhil, and Dillon. As they ate, they also compared notes. 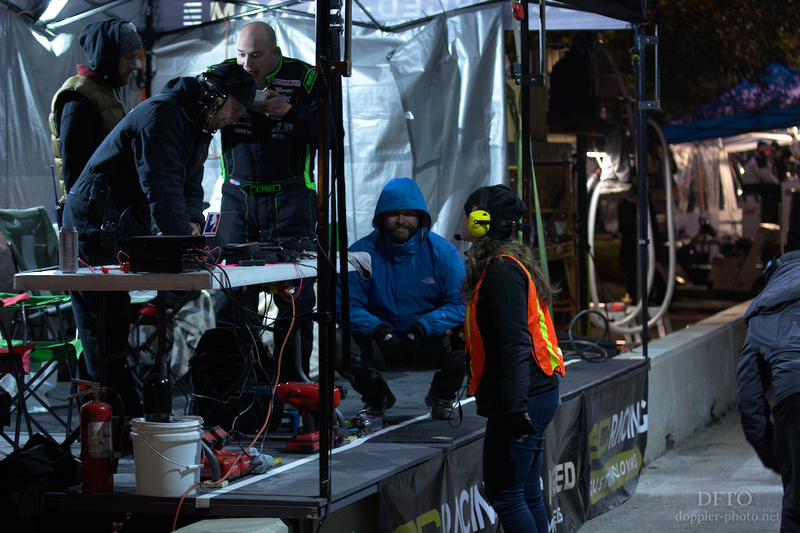 One of the newbies had caught a space-heater in the hot pit area (a big no-no, because of how much fuel is stored around the hot pits), after following an old-timer's tip to just stare the pit areas down to intimidate the teams. Another shared how they faced and won a small battle of wits when one of the teams tried their own intimidation tactics in an attempt to dodge a penalty. Looking back, it occurs to me that this is a big part of how these kinds of races proliferate. You find some new blood, and you make 'em feel at home. You give 'em a hand when it seems like they could use it, and you also give 'em enough responsibility so that they can recognize the fruits of their own efforts. And then you check in to make sure the experience is fun and worthwhile. For participants and observers alike, the details of the experience hint at the bigger picture. Next time, we'll take a closer look at the flaggers and how they get it done. Click here to subscribe, and don't forget to share!